The work of Lucy Stein has always proclaimed a preoccupation with the history of art, with a particular focus upon the evolution of European painting. This inquiry has found it’s way into her work via an intuitive and visceral approach. Her analysis is internalised and performed as tableaux rather than recast; her paintings demonstrate what Julia Kristeva refers to as the transverbal potential of images. According to Kristeva, images lend themselves more readily to playfulness, invention and interpretation whereas verbal or linguistic thought can have a repressive intellectual weight. This project at NICC remains firmly rooted in this methodology but also demonstrates how Stein’s research into other realms has had a significant impact upon recent work. In particular, Crying the Neck evidences a deepening exploration into Wiccan traditions and the historical landscape of Cornwall, two separate but entirely complementary strands of research. Stein’s work has become increasingly collaborative in recent years and this project is co-produced with Nina Royle with whom she shares a house in Cornwall. Royle is deeply engaged with the materiality of paint and shares Stein’s fascination with the landscape and folklore of West Cornwall, the cultural identity of which is distinct from the rest of England. Stein and Royle both possess strong familial connections to Cornwall and the histories and arcane energies of the landscape have been a vital guiding influences on both artists. 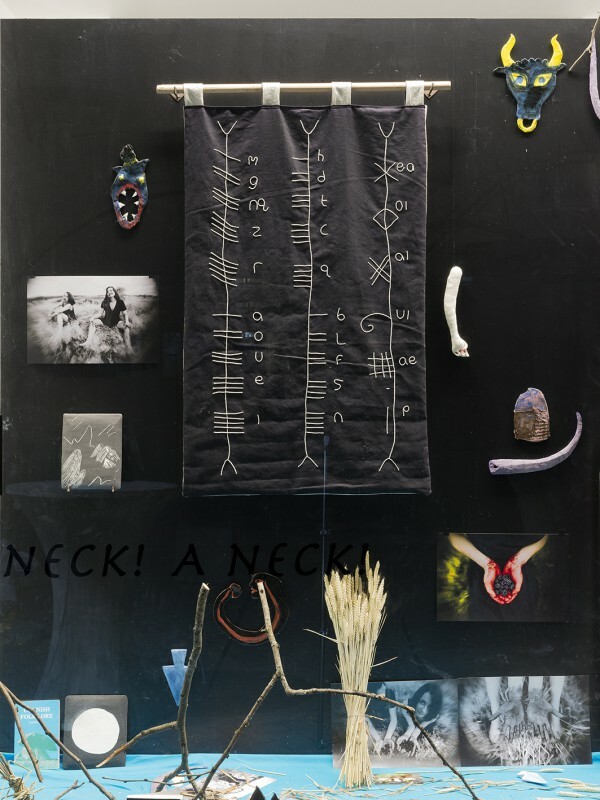 The display they have created together for NICC consists of painted dolls, fabric embroidered with the ogham alphabet, ceramic votive objects and carved tablets featuring archetypal imagery dyed with the juice of bramble fruits. Royle has contributed carved and dipped paintings produced in the shape of sickles, arrows and spearheads that have informed by her research into the history, symbolism and mythology associated with the colour black. This display of components from which this exhibition is comprised clearly possesses a ritualistic function and can for all intents and purposes be viewed as an altar. 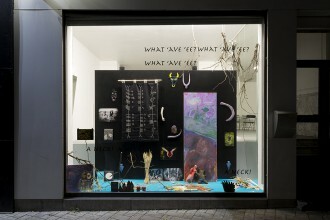 Indeed, the NICC installation specifically references the type of altars utilised in pagan pathways such as Wicca. Of the new religious movements to emerge in the 20th century, Wicca was perhaps the most significant. Adherents attune themselves to the rhythms of the seasons in order to commune with a ‘divine’ force. The Wiccan tradition allows for eclecticism, and can be adapted to the sensibilities of almost any community into which it is introduced. This eclecticism and versatility is one of the reasons why recent years have seen artists such as Stein embrace Wiccan practices. Although neither Royle nor Stein are themselves Wiccans, the installation that they have created for Crying the Neck is laid out in accordance with Wiccan practice which they have become familiar with via research carried out at the Museum of Witchcraft, in the Cornish village of Boscastle. The installation by Stein and Royle echoes the Wiccan altar in its inclusion of functional and symbolic components as well as elements that can be interpreted as representing masculine and feminine aspects. Moreover, the coordination of the opening of this project with the Autumnal equinox demonstrates an adherence to neo-pagan habitudes. Wiccan’s celebrate Sabbats on equinoxes, solstices and the four dates in between these. This project was scheduled to occur on the Autumnal Equinox to correspond with the harvest festival known as Mabon and the agricultural fertile window which denotes the descent into winter and the dark half of the year. There are numerous regional variations to harvest festivals and Crying the Neck refers to a custom once observed in Cornwall which has been revived in latter years. Essentially, the ritual stems from ideas rooted in animism; the belief held amongst agricultural communities that the ‘spirit’ of the last corn crop of the year should be recognised and respected. The Crying the Neck ceremony involves the ritualistic cutting of ‘the neck’ of the corn and was followed by music, dancing and revelry. Stein and Royle both refer to folk symbolism and iconography frequently and this exhibition embodies and perpetuates this tendency. The artist’s use of bramble juice as a dye is an allusion to both sacrificial violence but also to menstrual blood to extrapolate a feminist interpretation of the subject matter. 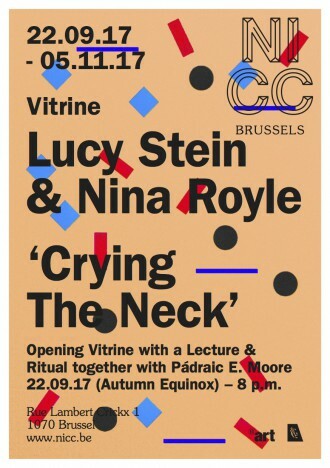 The opening of this exhibition culminates in an event that is part performative PowerPoint, part equinox celebration and part psychodrama. During this event Stein and Royle will be joined by Pádraic E. Moore and each will share their research with attendees before sanctifying and activating the Mabon altar. The various facets of this event highlight the anthropological and cultural connections between art and ritual both of which emerged from the same sphere and may ultimately satisfy the same desires. 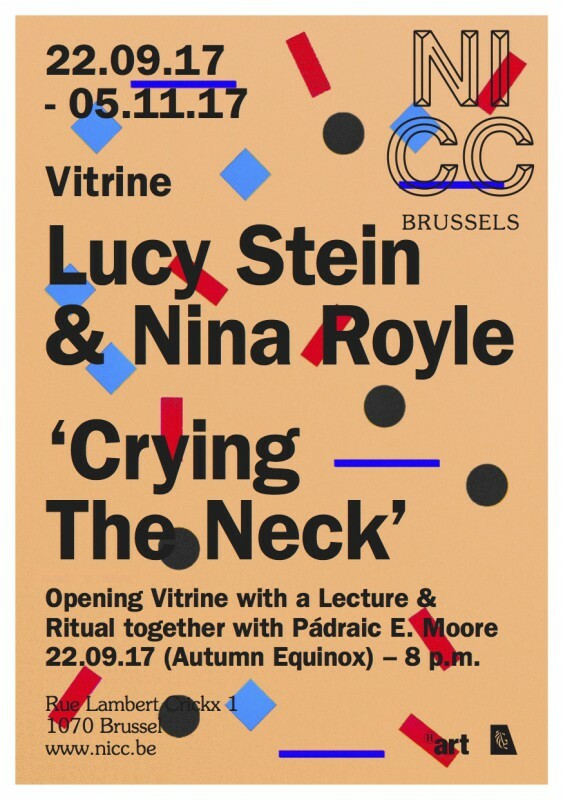 Crying the Neck underscores the fact that art is itself a form of magic with the power to subvert dominant modes of production, offer alternative forms of knowledge and provide new ways of living in and looking at the world.